How Do You Persuade a Scared Elder to Go to Dentist? Elder Care Memphis TN – How Do You Persuade a Scared Elder to Go to Dentist? The number of senior citizens in the U.S. rises each year. In 2014, the U.S. Census Bureau said there were 46.2 million seniors in the nation. In 2015, that number had risen to 47.8 million. Of those millions, it’s estimated that about 18 percent have cavities that go untreated. It’s also estimated that about 6 out of 10 seniors have gum disease. Your parent should go for two dental checkups each year. If your mom or dad is too scared to go, it’s a fear you’ll have to work on. Here are some tips for helping your parent overcome the fear of the dentist. Dentists have changed over the decades. You might find your dad recounting horror stories about his dentist drilling a tooth without using any novocaine. Your mom might remember a dentist pulling a tooth after a painful, burning injection of novocaine. Your mom may remember her dental hygienist telling her was too ugly to ever have a boyfriend because she didn’t have perfect teeth. Your dad might remember a dentist who strapped his arms to the chair to keep him from moving. Dental insurance can be very restrictive on what they do and do not cover. Your dentist may have used a resin filing rather than metal. As a result, the dental insurance company denied the claim saying it was cosmetic. Your parents had to pay out of pocket and struggled to get the money together. That can lead to fear. All of these situations can create a level of fear that keeps your parent from going to the dentist. Even though times and treatment methods have changed, your parent is stuck on how it was in the past. It makes your mom or dad scared or even ashamed to go back. To get your parents to go to the dentist, take small steps. 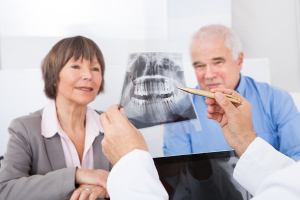 If possible, find a dentist that specializes in fear and anxiety and elder dental care. The dental visit can go slowly. With each additional visit, your parent will gain confidence and stop being scared to go. Start out with a simple interview session with the dentist. No dental tools come out. If possible, the dentist could meet you in his office. Once your mom or dad is comfortable with the dentist, the next visit can start to get your parent used to modern dental tools and techniques. As your parent gets used to the changes, the fear will slide away. Ultrasonic scalers instead of the old metal hook will be far more tolerable to your parent. Needle-free anesthesia will also impress and ease stress when your parent is scared of the dentist. Make sure your parent always has a ride to the dentist. If you can’t go, hire an elder care aide to provide support and companionship at the dentist. Call our elder care agency to discuss these and other elder care services. For Elder Care Services in Memphis TN, please contact the caring staff at Personal Care Services MidSouth today! This entry was posted in Elder Care Memphis TN, Personal Care Tips and tagged Elder Care Memphis TN. Bookmark the permalink.